With warming weather come contemplations of bagrada bug. This is the time in the past when we start to find bagrada bug populations on flourishing shortpod mustard plants or patches of pepperweed in the Salinas Valley. We thought this would be a good time to update everyone on continuing work associated with long-term management of the bagrada bug, as we begin another year of a field study looking for resident natural enemies that target bagrada bug eggs in California. We also wanted to remind everybody to keep an eye out for bagrada bug and provide a quick reminder about where to look and what to look for. If you do find substantial bagrada bug populations or have problems with bagrada bug damage in your fields in the Salinas Valley, please reach out to Alejandro Del-Pozo (adelpozo@ucanr.edu, 831-759-7359). We'd love to get a better handle on the situation in the area to better serve you. 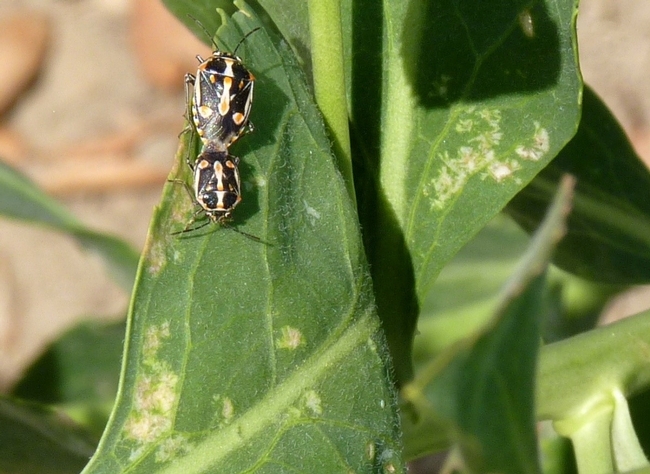 We (Alejandro) have been scouting for bagrada bug on weeds near San Ardo for the past three weeks. Thus far, there have been no bugs or damage. First, for an update on our work on biological control. 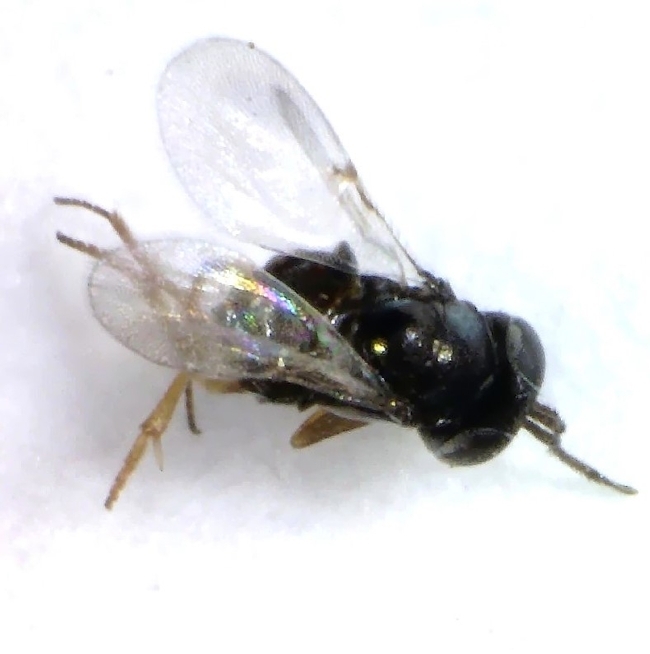 As part of a grant from California Department of Food and Agriculture's federally funded Specialty Crops Block Grant Program, and support from Farm Bill funds, a number of researchers (CDFA, USDA-ARS, UC Davis, and UC Riverside) are surveying for resident parasitoid wasps that attack bagrada bug eggs. The long-term goal is to support the introduction of parasitoids from the bagrada bug's native range (e.g., Pakistan) in a classical biological control program that will suppress this pest across the landscape. As far as stink bugs go, the bagrada bug is a peculiar beast when it comes to laying its eggs. Rather than sticking them to leaves in clumps like other stink bugs, they instead lay the majority of them in the soil (Fig. 1, video below). Fig. 1. Bagrada bug eggs. 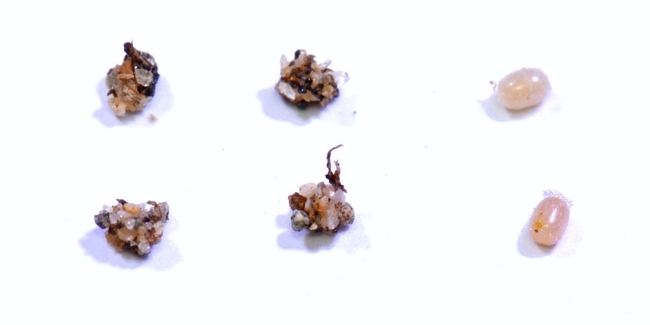 Eggs on the left were laid in soil, while the ones on the right were not. When laid, the outside of the eggs are sticky, causing soil particles to adhere to the eggs. Before we introduce any parasitoids, we first need to know what parasitoids and predators already attack bagrada bug eggs in California. To address this, we are placing eggs glued to cards in the field both in the plant canopy and on the ground and in both patches of weeds (non-crop areas) and in cruciferous crop fields (Figs. 2-4). We put these sentinel eggs (generally freeze-killed) out for several days and then bring them back into the lab to allow any parasitoids in the eggs to develop and emerge. We also check the eggs for signs of predation because natural enemies such as ants, earwigs, or ground beetles could feed on the eggs and destroy them. 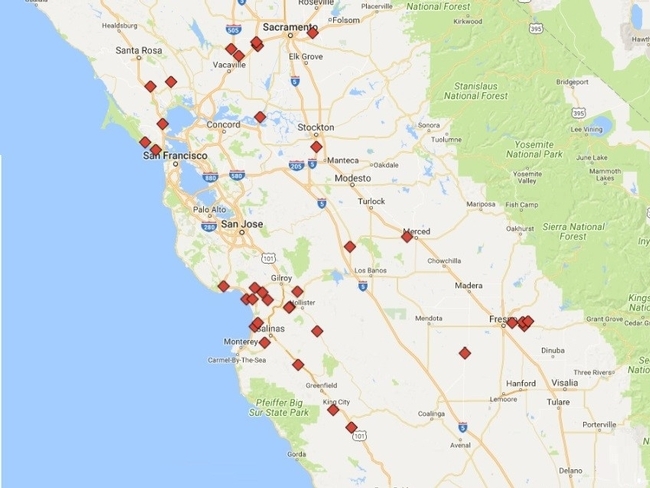 Our survey sites cover a region from the Sacramento/North Bay area south to San Ardo and Fresno (Fig. 5). Fig. 2. 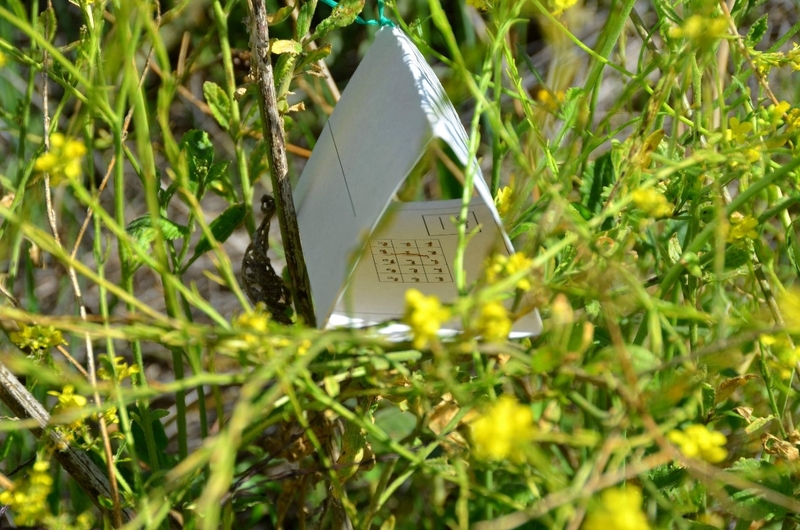 An egg card placed in the foliage of a shortpod mustard plant. Fig. 3. 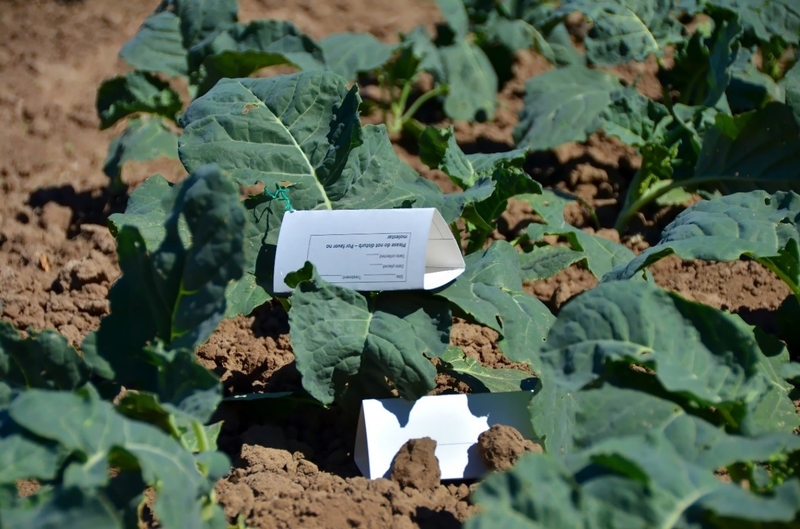 Egg cards deployed in a young broccoli planting. Fig. 4. 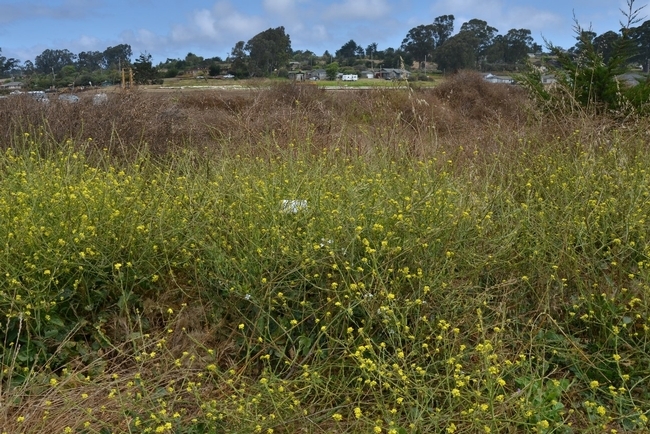 A typical patch of shortpod mustard, with an egg card in the foliage and another on the ground, hidden and tucked under the plant. Fig. 5. Sampling sites, minus one near Bakersfield (via Google Maps). What have we found? Thus far (2017), we have found very little parasitism by natural enemies in the Central Coast and in the Central Valley. 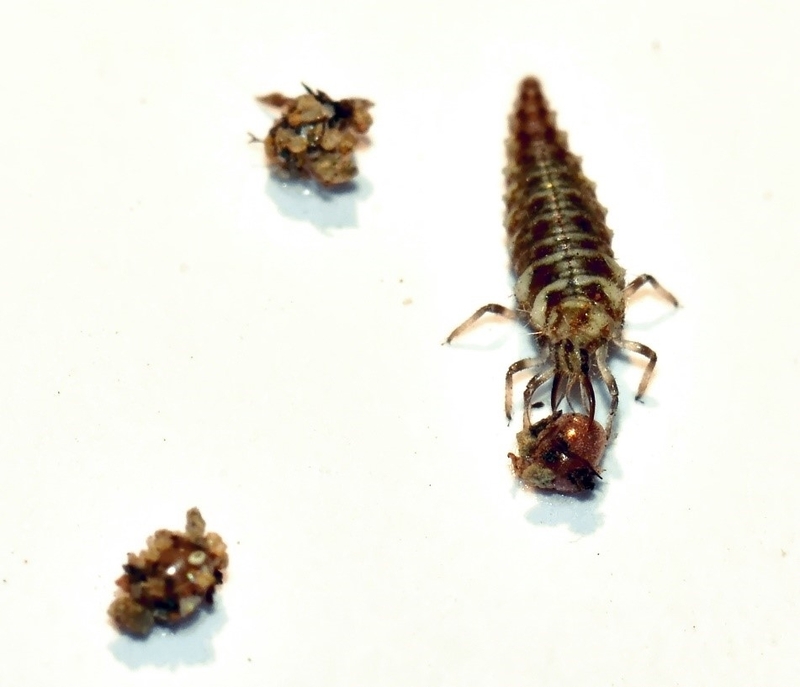 Higher levels of parasitism have been recorded in southern California. We have recovered parasitized eggs from only four of the hundreds of cards we have deployed in central and northern California. We recovered one species, a member of the genus Ooencyrtus, from one card in the Davis area (Fig. 6, three individuals), another Ooencyrtus individual from near Winters, and Trissolcus erugatus (one individual) from the Petaluma area. For one of the cards at the same Davis site, eggs were parasitized, but adult wasps did not successfully emerge. Notably, work further south by Dr. Thomas Perring at UC Riverside has discovered greater levels of parasitism. Predation varied at our sites and ranged from none at all to nearly all eggs destroyed (Fig. 7). Time-lapse cameras at a few of our sites helped capture these predators in action (videos below). Many of these eggs were easily accessible on the cards (vs. buried in soil or crevices), so this is likely an optimistic estimate of natural levels of predation on bagrada bug eggs. However, covering eggs with 1 or 2mm of sand for some cards did not cause predation to drop off. There are clearly predators out there in the landscape that are willing and able to eat bagrada bug eggs. Fig. 6. Ooencyrtus sp. recovered from one of the sentinel eggs. Fig. 7. A green lacewing larvae feeding on a bagrada bug egg in a laboratory feeding trial. What to do with respect to scouting? 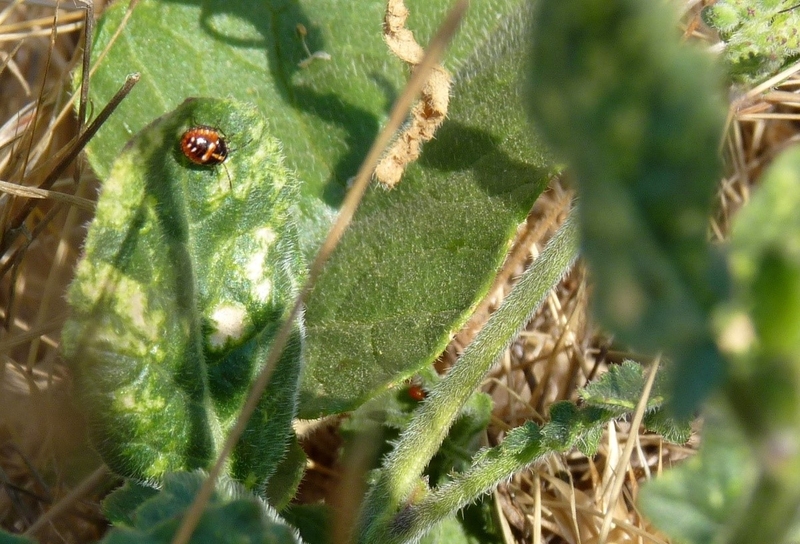 We have recommended in the past that cruciferous weeds near fields be scouted for bagrada bug (see this previous post for more information about the association between bagrada bug and non-crop hosts). Now is the time of year to start doing this to get an idea of what kind of bagrada bug pressure you might be facing. We don't know exactly how far bagrada bugs will travel to invade fields, but checking likely areas within several hundred yards to a half a mile will give you a good idea of what is happening nearby. Shortpod mustard and perennial pepperweed are the two species to pay attention to, so look for areas with these plants. You want to mainly look for damage (Figs 8 and 9), but also for the insects themselves. Damage on leaves is often much easier to find than bagrada bugs. This is especially true at low population densities, although finding bagrada bugs will confirm it is not simply harlequin bug damage (damage is similar). For damage, you can scout at any time of the day. For the bugs, the warmer the better because they become more active at higher temps. See the weed post linked above for pictures of what these plants look like if you are not already well-acquainted with them and to see additional pictures of damage on weeds. Fresh damage consists of still-green starbursts, which will turn white as it ages. Obviously also keep an eye on your newly planted crops for damage, but this nearly goes without saying. Fig. 8. Mating pair of bagrada bugs on perennial pepperweed. Note the fresh damage in the top right where you can still see the “rays” of the starburst damage. Damage in the bottom left is older, with leaf tissue becoming necrotic and damage becoming less defined. Fig. 9. Bagrada bug nymph on perennial pepperweed. Damage immediately adjacent to the nymph is fresher than the damage on the left side of the leaf.